Check out our blog for our latest adventures. Earlier this year, we headed to Bimini Island to dive. We boarded the ferry from Miami which is a relatively short ride. Upon arriving to the island the first thing you notice is the amazing turquoise color of the ocean. 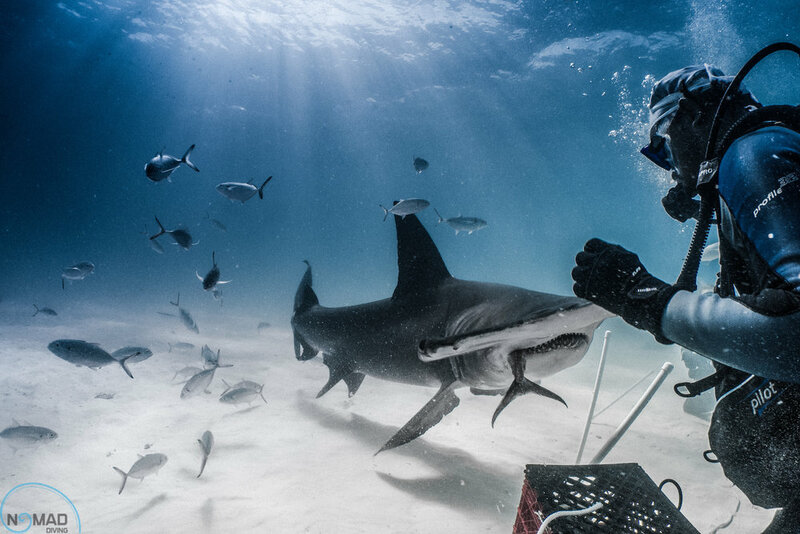 When the water starts getting colder during winter, this is the best place to dive with and photograph great hammerhead sharks. The dive site were the hammerheads aggregate is basically a huge sand patch 15-25 ft deep. Every morning as soon as we arrived our guides @Pablo F. Aviles and @Max Devine would start chumming (having the right chum is very important for this sharks in particular as they are picky eaters). The first sharks to show up are usually nurse sharks, which are very curious and will stick around for the entire dive, another shark that is common to see is the bull shark. Although this isn't always great news as they tend to scare away the smaller hammerheads. Once the first great hammerhead was spotted @Cris, @Christian and I would get our dive gear and cameras ready and jump in the water. For me, it is always a challenge taking creative shots. Getting the right angle, the perfect lighting and everything you are looking for in a photo makes for different opportunities on every dive. I was lucky my good friend Christian who excels at creating unique images was around. He has always given me great advice about photography, almost everything I know I have learned from him. He has the heart of an artist and is focused on spreading the word on conservation through his images. He is one of my favorite photographers and it is always inspiring to look at his work. 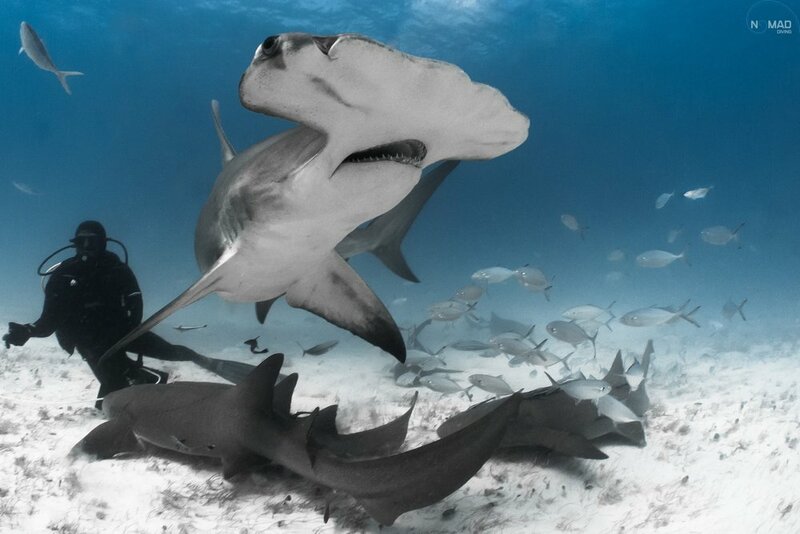 You can check it out in his website www.christianvizl.com and some of his great hammerhead photos below. Looking at the sharks gracefully moving made me forget about the outside world and only focus on what was happening underwater, enjoying every single moment with the great hammerheads. Bimini is by far one of the best dive sites around the world to see this amazing animals in clear blue water. Can’t wait to dive again with the Great Hammerheads and share with you all the exciting details about the expedition. Check out our expeditions and join us! Nomad Diving animal encounters take you to the best scuba diving and snorkeling destinations in the world. Best photography opportunities diving with sharks, mantas, whale sharks, crocodiles, whales, striped marlins and much more species. This is a story that took place last year. A quest to find Striped Marlin (Kajikia Audax), which was a reminder of why it is always important to keep exploring and how persistence is key when you want to achieve something. Irene @panchita_oh, Christian @christianvizl and I decided to spend a month in Baja. This land is still a wild place, despite the fact that thousands of tourists go there every year and that you can see signs of civilization in certain areas, there is still a feeling to it that attracts like-minded people with a thirst for adventure. And if you look in the right places it is full of surprises. 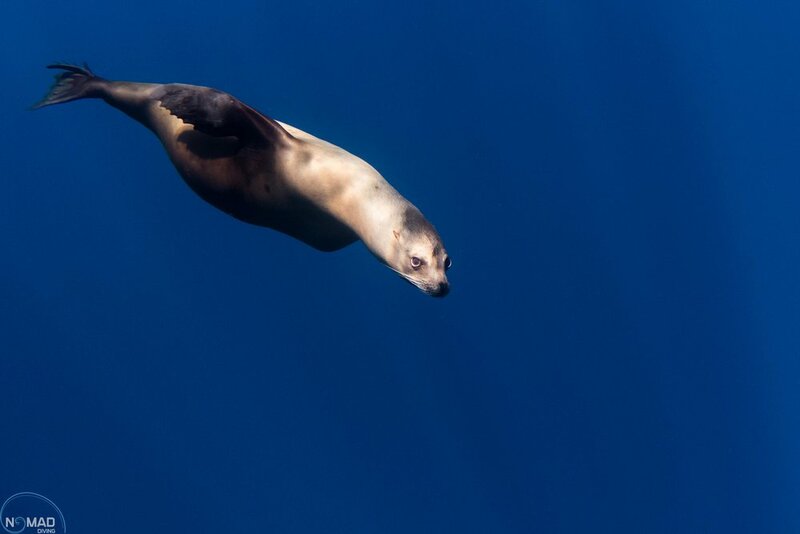 We chose La Paz as our base where we got to hang out with lots of friends and spent several days diving with sea lions, snorkeling with whale sharks and visiting a few other dive sites in the Sea of Cortez. But we felt like we were missing something. 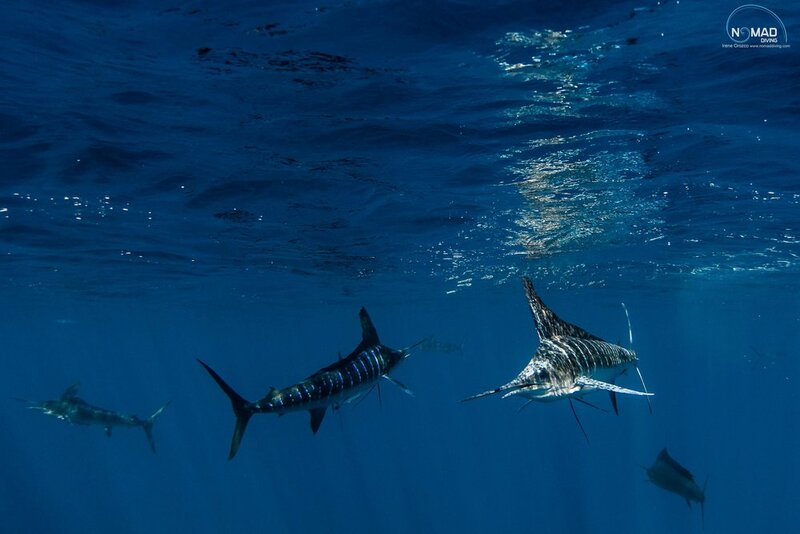 There were reports of Striped Marlin hunting sardine bait balls in the area. This got us really excited and after doing some research and getting a few tips from people who are knowledgable on the area, we decided to pack our dive gear, get our cameras ready, and hit the road. We drove north and took our chances. Upon arriving to the location, we spoke to a local fisherman who would be our captain. He told us it would be a gamble to take us looking for striped marlin hunting on sardine bait balls in the area, as it had been a while since the last time they were successful. We didn't have big expectations, as we knew finding them could be difficult. Fishermen from all over the world travel long distances to catch them. 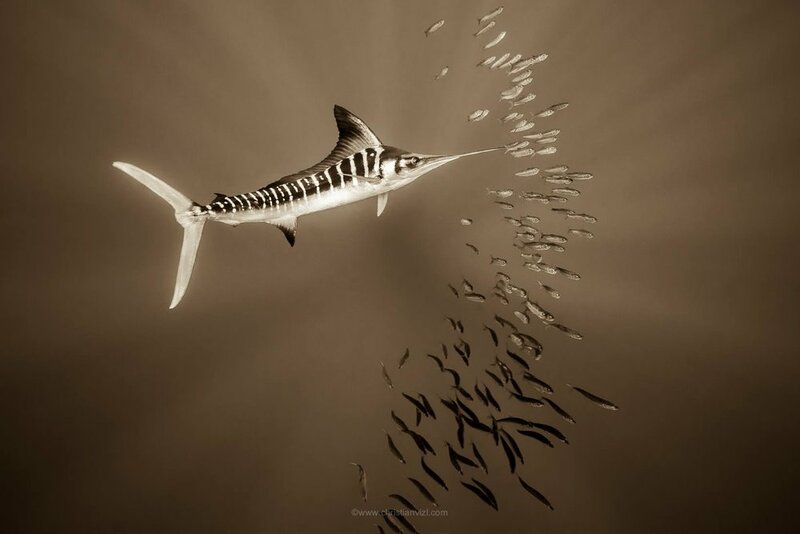 For us as well as for many other ocean enthusiasts out there, striped marlin are a unicorn. Not only for their bill, which is one of their distinctive features, but because they are hard to find. The next morning we woke up at 5 am to have a delicious breakfast in town. 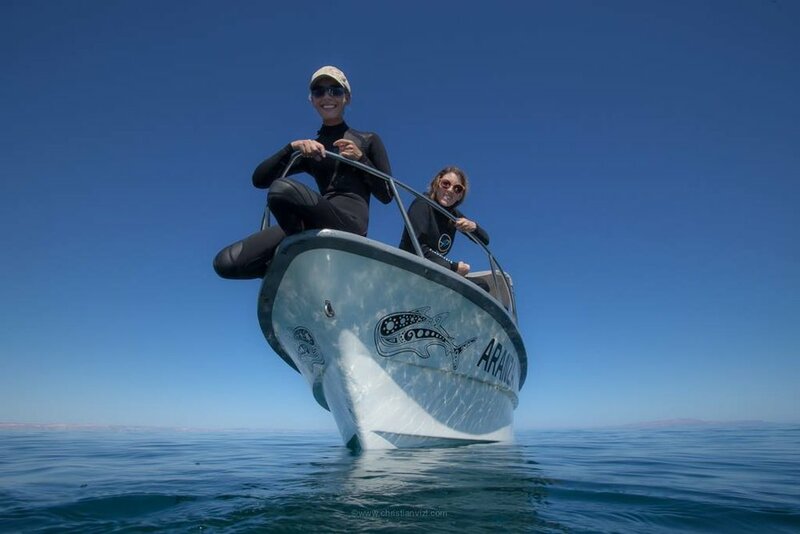 Afterwards, we got all our gear onboard and took the panga ride to the open ocean. It took us over 2 hours to get to a sea mount where we could see a few other boats. The lack of bird activity and the calm in the surface of the ocean, made me think that we would not be successful that day. Our Captain asked one of the fisherman if he had seen any activity. His response wasn't what we expected and it was time to make a decision. We could keep going further offshore or go back and try something else. Irene, Christian an dI looked at each other and decided to keep going. A few minutes later we saw some bird activity. It got our hearts pumping faster and we started getting ready. As we got closer, the splash on the surface of the ocean confirmed we where in the right spot. Before we could even get in the water, they were gone. Billfish are extremely fast and encounters can last anywhere from 2 seconds to over 1 hour or more. So you need to be ready to seize the moment. Knowing they were in the area, we kept going until we spotted some more bird activity. After a few minutes there were so many birds on the horizon, we didn't know where to go. Hundreds or maybe thousands of striped marlin where hunting. There were multiple bait balls in the area and it was a matter of choosing one and jumping in. We spent hours that day swimming with them taking pictures and video. I never thought it would get to a point were we would be so tired, that everyone would want to go back to shore. The ocean gave us an incredible opportunity that day and we were smiling from ear to ear, knowing that we could have missed it if we didn't take our chances. The next few days just kept getting better and better. We saw dolphins, whales, sea lions and turtles too. On the last day we spent over 45 mins on a single bait ball. 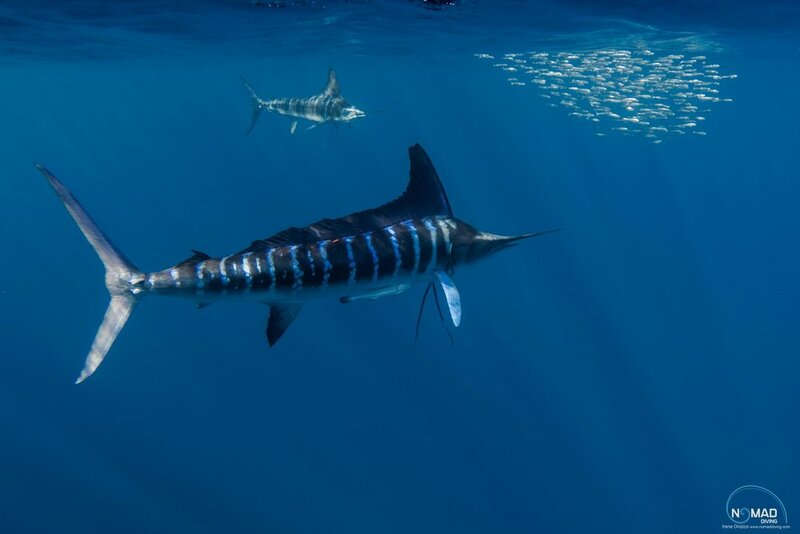 Striped Marlin were all over the area. This has been one of the best adventures I have had the pleasure to share with Irene and Christian up to date. This is a great place for pelagics and we will be back next year. Check out our expeditions and join us for an unforgettable experience!